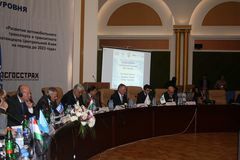 On 18 September 2013, The High-Level International Conference “Development of road transport and transit potential in Central Asia for the period up to 2023” was held in Dushanbe under the patronage of H.E. Mr. Emomali Rahmon, the President of the Republic of Tajikistan. Under the patronage of H.E. Mr. Emomali Rahmon, the President of the Republic of Tajikistan, September 18, 2013 in Dushanbe, international high-level conference "Development of road transport and transit potential of Central Asia for the period up to 2023", hosted and organized with the participation of the Government of the Republic of Tajikistan jointly with the International Road Transport Union (IRU), Intergovernmental Commission of TRACECA (IGC TRACECA), the Office of the High Representative of the United Nations (UN OHRLLC), the Organization for Security and Cooperation in Europe (OSCE), and the Association of International Road Transport Carriers of Tajikistan (ABBAT). During the discussions, the participants of the meeting mentioned that one of the main objectives is to improve the transit transportation in the region. The urge for dynamic growth of the volumes in the international trade is an incentive to carry out activities aimed at optimization, efficiency increase and ensuring the security and stability of the traffic in the region. Mr. Eduard Biriucov, Secretary General of TRACECA noted that the transport links of TRACECA routes are focused on the mutually beneficial cooperation on the entire Eurasian continent. 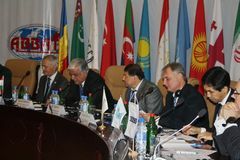 TRACECA member countries shall endeavor to develop the efficiency and attractiveness of the transport corridor of Europe-Caucasus-Asia, liberalization of foreign trade and the reduction of barriers on the way of cargo transportation, especially uner the formation of the Eurasian effective transit communication. Road transport technology on TRACECA corridor has specific characteristics due to the multimodal components, which requires a complex organization with the assistance of the competent authorities of the participating MLA countries. In order to create long-term framework for the sustainable development of the corridor, it is essential the comprehensive approach to solving the problems of transport infrastructure. 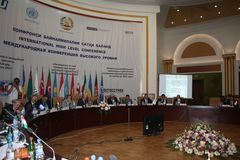 The issues of the prospects of implementation of the SCO Agreement on the creation of favorable conditions for international road haulage, CAREC experience and future challenges and opportunities as well as facilitation and computerization of the customs clearance and border control procedures considered within the Agenda of the meeting. 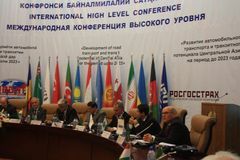 Following the discussions on the IRU Model Highway Initiative Joint Statement have been signed by the representatives of Afghanistan, Kyrgyzstan and Tajikistan.